Over the past few years, we’ve seen a fair few add ons for guitarists wanting to use their iOS device as a portable rig, and whilst great for home practice (and, to a degree, studio use), their reliance on your device means that you’d probably want to avoid playing live with one if you value it not being potentially wrecked at the end of a show. Thumbs up then to Digitech, an established name in guitar FX which has made use of iOS devices in some of its recent guitar tech in a clever new way – not as a portable rig or FX emulator, but instead as a useful means to configure using the iPhone/iPad’s touchscreen. 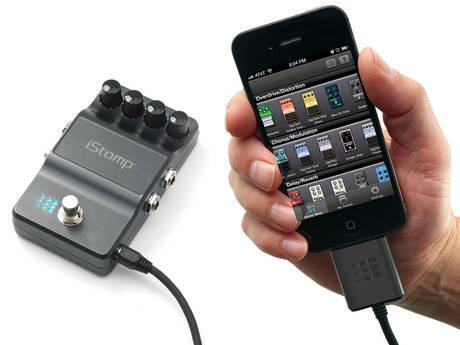 The first of Digitech’s iOS devices comes in the form of a guitar pedal (or stompbox) called the iStomp. This durable looking piece of kit hooks up to your iOS device via the 30pin connector, and is managed using the rather cool Stomp Shop app which is available for free in the App Store. The Stomp Shop is a collection of FX pedal emulations that you can purchase and load into the iStomp, although two – a searing overdrive called ‘Redline’ and a clean sounding Digital Delay are included for free. The emulations, which include classics such as the Boss CE-2 Chorus, Electro Harmonix Small Stone Phaser and my favourite distortion pedal the Proco Rat, are great quality and can be loaded into the iStomp in around 30 seconds. Although configured by the app, the iStomp can operate independently from it since the actual processing is handled from within the pedal itself, and the FX are controlled via four unlabeled knobs on the pedal. This frees you up from having to take an iOS device on stage with you and means you can simply treat it like a normal stompbox even when it’s not hooked up to your iPhone or iPad. At around $150/ £150 the iStomp is fairly well priced, especially when you bear in mind that any one of the FX pedals it emulates costs around half of that, and I’m sure Digitech will be adding value by extending the range of available FX in the future too. 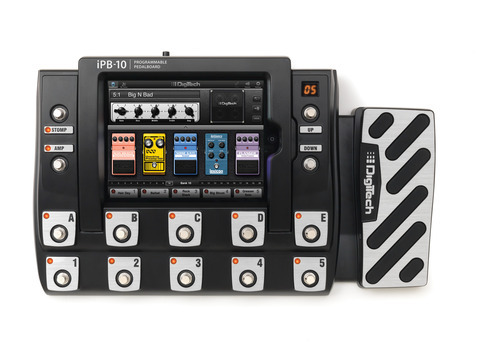 The iPB-10 essentially takes the concept of configuring using an iOS device and scales it up from the iStomp considerably to create the world’s first iPad-controlled guitar pedalboard. Rather than an individual guitar effect, the iPB-10 instead offers an entire rig, and with a pretty extensive range of options too. Offering 87 FX pedals, 54 amps and 26 speakers, via the iPB-Nexus app it allows you to build your dream rigs and control them with a set of footswitches and an expression pedal. Like its younger sibling, it’s built like a tank and can operate independently from an iOS device for live situations where you would want to avoid stomping on you iPad. As with the iStomp, the sonic quality here is superb, the Fender Blackface and Marshall Super Lead amp emulations seem especially close to the real thing, as do many of the classic FX pedals included. The Nexus app also makes managing the available amps and FX far easier and more fun than the usual LED screens available on normal pedalboards too. Since the iPB-10 contains pretty much everything the average guitarist could want from a pedalboard, and unlike the iStomp does not require any further app purchases, the $499/£400 price tag seems justified, just as long as you already own an iPad or are looking for a good excuse to get one. Both the iStomp and iPB-10 appeal to me as both a geek and a guitarist, with the latter I regularly found myself sat on the sofa with my iPad using the Nexus app to build dream guitar rigs (and grinning manically for the most part) which I’d play through later on. It’s clear Digitech have put a lot of thought into both the apps and hardware here and created some unique tools that will benefit iPhone/iPad wielding guitarists everywhere. Read: Turn your iPad into a serious music-making machine with these new accessories.